Snow like cotton candy drifting softly through the air. The lights on my neighbor's trees twinkling cheerfully through my living room window at night. Presents wrapped in vintage paper with matching bows, tucked beneath the outstretched arms of the Christmas tree. Red wine in bed on Christmas Eve. Snuggling with my little loves, watching Rudolf on TV. The old milk glass nativity scene, set carefully on the coffee table, because "that's what Christmas is all about, Charlie Brown." Fluffy socks and warm sweaters. A house full of family and friends. Hugs, laughter, and games that stretch late into the night. And the smell of panettone in the air. The things I treasure most this time of year! If only I could capture them all in a bottle to bring out in February when the joy of Christmas has faded and winter seems never ending! At least I can stash a panettone in the freezer for a bit of holiday cheer later on. Panettone is a traditional Italian Christmas bread, studded with candied orange peel and citron. Since I absolutely love figs, I load mine up with them instead. They add such an appealing crunch! Please don't be intimidated by panettone. There are a lot of steps, yes, but they're easy and largely unattended. Good panettone, like love, needs time and patience. It can't be rushed, but it is well worth the wait. 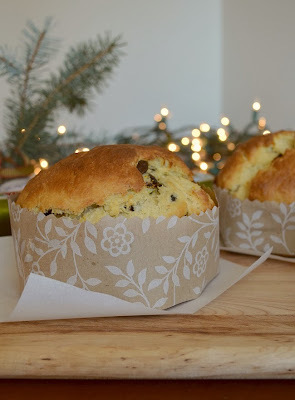 Traditional panettone paper molds can be purchased on line or in specialty shops, but I simply bake mine in 5 inch oven safe bowls with straight sides. 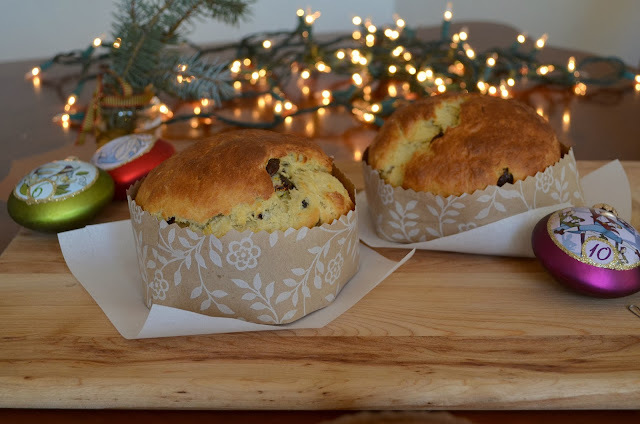 Wrap them in pretty craft paper if you wish and serve them warm on Christmas morning. This recipe makes two mini loaves or one large one. Wishing you many blessings this holiday season, and a Christmas full of all the things that make you merry and bright! Cheers! In a large bowl, dissolve the yeast in the warm water with a pinch of sugar. Let the mixture sit until foamy (about 5 minutes). Add 1 1/2 cups of flour and stir until the mixture comes together in a ball. If the mixture seems too dry add a teaspoon more water. Cover the bowl with a towel and set in a warm area to rise for 1 hour. After an hour the dough should have doubled in size. Punch it down in the middle and add the beaten eggs, the soft butter, the sugar, salt, vanilla and orange extracts, the remaining 1 1/2 cups of flour, and the orange and lemon zest. Stir with a wooden spoon until the dough starts to come together. Place the dough on a floured surface and, with floured hands, knead it until it is uniform and smooth (adding more flour if the dough becomes too sticky). Place the dough in a clean bowl that's been sprayed with non-stick spray. Cover with the towel and allow to rise for another hour. Once the dough has risen, place a pan of hot water on the bottom oven rack (to create steam) and turn the oven to 425 F (220 C) to preheat. Chop the figs and prunes to roughly the same size as the raisins and dates. Turn the dough out onto a floured surface and spread it out. Add the chopped fruit to the middle and begin kneading the fruit in. Keep kneading, adding flour if necessary, until the fruit is evenly spread throughout the dough. Butter two round baking dishes that are approx. 5 - 6 inches in diameter. Cut a round of parchment paper to fit the bottom of each dish. Cut the dough ball in half and place in each dish. Cover the baking dishes and let the dough rise one last time for 20 minutes. Place the baking dishes on the top rack and bake for 15 minutes. Turn the oven down to 350 F (175 C) and continue baking for 18 - 20 minutes until the loaves are very brown on top. Cool in the pan before slicing and serving. Thank you for your reply, a merry christmas to you too! Your panettones look incredible, Rebecca! 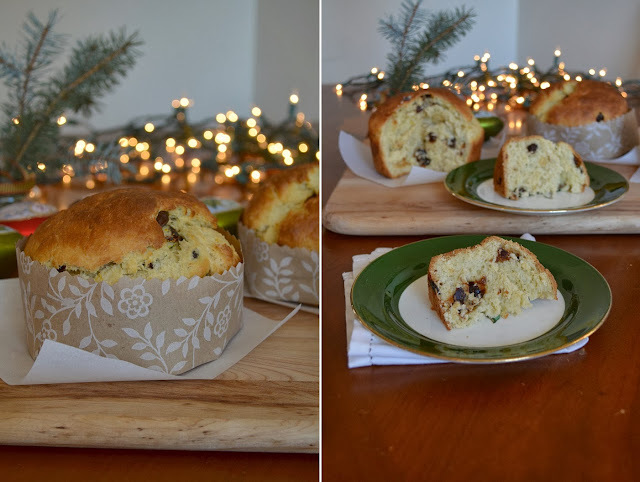 I've enjoyed panettone several times but never have made them myself. I definitely bookmark this recipe for neyt year.